In 1-quart saucepan, heat all sauce ingredients to boiling, stirring occasionally; reduce heat. Simmer uncovered about 5 minutes, stirring occasionally, until thickened. Keep warm. In 8-inch nonstick skillet, heat oil over medium heat. Add onion; cook 2 minutes, stirring occasionally. Add spinach; cook 2 to 4 minutes, stirring constantly, until spinach is thoroughly heated. In small bowl, beat egg product, thyme, salt and pepper; pour over spinach. Cover; cook over medium-low heat 5 to 7 minutes or until eggs are set and light brown on bottom. Sprinkle with cheese. Cut into wedges. Serve with sauce. 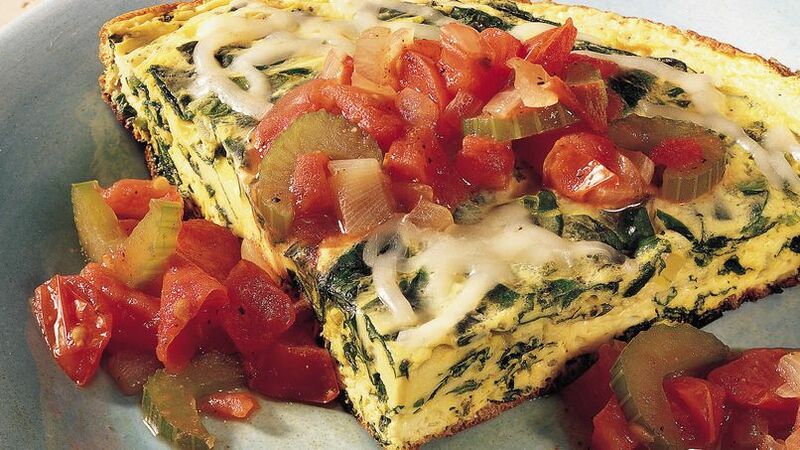 Explore the flavors of France, Spain and Africa with the zesty Creole Sauce topping this classic spinach frittata.